For the last few years, I’ve been walking the Bruce Trail with my sister Martha, my partner David, and all kinds of friends. We started in Queenston, ON, at the beginning of the 885-kilometre trail and hope to reach Tobermory at some point in our lifetimes. Walking through the hidden beauty of Ontario is a beautiful thing to do, especially in the spring. Already a fan of the Greenbelt, I was delighted when Burkhard Mausberg, CEO of Friends of the Greenbelt Foundation, approached Barlow with his idea. He had written a book: the story of the Greenbelt, which includes the Oak Ridges Moraine and the Niagara Escarpment, where I’ve enjoyed so many walks. He had a mission: to use this book to help protect the Greenbelt. We were in. 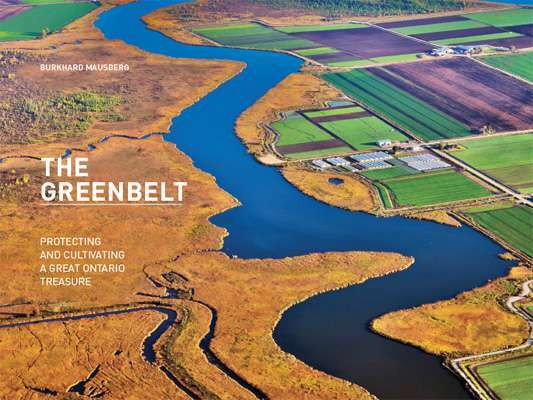 The goal was to produce a beautiful and informative book that would show that the Greenbelt, a creation of both Liberal and Conservative premiers, is not just the world’s biggest protected green space, but the strongest. It took 10 months to edit, design, layout, proofread, and print The Greenbelt, the glorious book we published this week, and the care and attention to detail is reflected in every page. Freelance managing editor Tracy Bordian of At Large Editorial Services thoughtfully managed the entire production process, overseeing the editing, interior design, layout and page proofing. Freelance book designer Kyle Gell created the beautifully clean and simple interior design based on Gary Beelik’s wonderful cover, which made use of an amazing aerial shot by land use planner Michael S. Manett. Good photo selection and composition was key to this coffee-table book. Kyle sifted through the hundreds of photographs provided by Burkhard and his team to find the ones that would best illustrate the Greenbelt’s beauty and the vivid life in the farmers’ markets, the vineyards, and the Greenbelt’s storied cliffs and trails. To ensure that the photography was the best it could be, Kyle used Photoshop (and a whole slew of digital filters) on each photo to enhance the colour saturation and complement the overall lighting. It also turned out to be a great strategic move: the book needed to be printed on the most environmentally responsibly paper stock possible, which meant recycled and uncoated paper. Printing highly visual books on recycled paper can be a challenge, as colour photography can often end up looking dull and washed out. By pushing the colour saturation, Kyle hoped to compensate for the paper’s tendency to dull images while maintaining the striking colours of the beautiful nature photography. To help us meet the environmental paper standards we desired, one of our Canadian printers, Quebec-based Marquis, stepped up to the plate. Lori Rennie, our printing rep, introduced us to a paper called Marquis Opaque. It’s 30% recycled and 70% FSC-certified, which means that the trees have been cut using the highest standards of forestry stewardship. This paper has earned the UL ECOLOGO Certification. We went with it. When I first held The Greenbelt in my hands, I was thrilled at the result of everyone’s efforts. You can really see Burkhard’s passion for the Greenbelt shine through the pages. The design and photography are beautiful, and the paper feels wonderful. It also feels pretty good knowing that our paper selection supports better conditions for forests and the people whose livelihoods depend on it.